The Christian Wife Life: question vlog. Megs at Shine On...Tales of a Twenty Something did a vlog link up with some interesting questions so I thought I'd participate. Why not. So if you wanna get to to know me a little better and actually see what I would look like if you talked to me in real life (sort of) then play the video. If not, don't bore yourself. Forgive the lighting and video quality please. It's definitely not flattering. Haha. What is your FAVORITE thing about living in [your city], and your LEAST favorite? What is the favorite place that you have visited? What is your favorite memory from the place? If you could be a superhero, what would your name be and what would be your powers? What's the best gift you've been given? Who's your best friend and why are they your best friend? If you were stranded on a desert island, what three DVDs would you want? Books? If you had to choose a fruit to describe you, what would it be? What cartoon character is most like you and how? Tell us about the happiest time in your life! What made it so great? What's something you want to do before you turn 30? 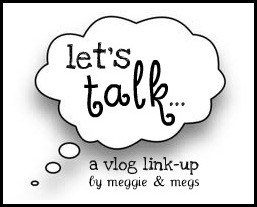 You should do this too and link up with Megs! Do it! Hope you're having a happy weekend. I have so many posts coming up that are exciting - that giveaway I talked about a while ago, another episode of The Real Housewives of the Blog World, a cleaning/organization post, and so much more! YAY. Also, something that I'm going to do tomorrow is look up the Twitters of every single blog that I follow so I can follow them. Since I have this new phone I'm gonna be tweetin' all up in here. That was so cool and fun to watch. I love your passion and love for God, and your answer of what you want to do before you turn 30 is amazing I myself have also always wanted to start some sort of outreach ministry or non-profit children's organization. I could definitely get serious about some of your answers, because there were a lot of good ones, but I am going to have to go with the kiwi answer right now! It made me laugh so hard :) HAHA! Thanks for sharing!!! Glad to get to know you better! This is cute :) and I'm going to do it when I get home! it's fun getting to know you more girl!